Trailhead and parking area are at Cannon Mountain Ski Area on Rt. 18 in Franconia. It is 0.5 miles west of Rt. 93 at exit 34C. Park in the south end of the parking area, as shown by the "hiker parking" signs. Cannon Mountain is widely known for its tourist attraction known as the Cannon Mountain Aerial Tramway, one of the most popular features of Franconia Notch State Park. In the summer, it carries tourists to its summit station, where gravel paths lead to the observation tower on the true summit, which provides spectacular 360-degree views. In the winter, the tramway transports loads of skiers to the top of its state-managed ski area. For hikers, there are several trail approaches to choose from. The most popular is the northernmost section of the Kinsman Ridge Trail, one of the shortest hikes to a 4000-footer. Although short, the hike to Cannon Mountain is far from easy, involving a constantly rough and rocky climb through a very steep ski trail. 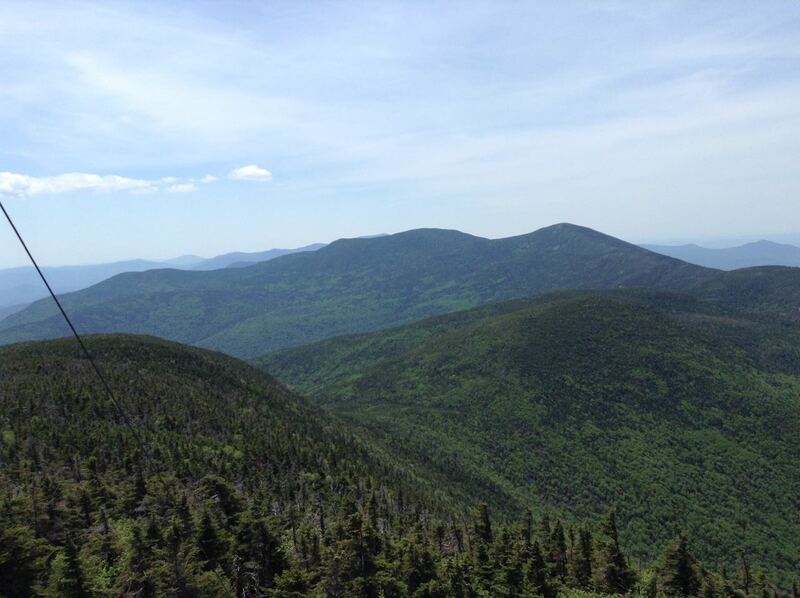 On the way, the Cannon Cliffs viewpoint yields a wonderful view across the notch to the Franconia Range. From the parking area, follow the signs for Kinsman Ridge Trail down a dirt road on the far left. In a short distance, turn right and walk along the left side of a huge gravel pile, then turn left into the forest at the sign marking one end of the Kinsman Ridge Trail. The trail quickly begins climbing. After the first few steep pitches, the trail swings to the right and angles up the slope, still climbing steeply. It soon begins switchbacks, and not too far into them becomes horribly eroded. Climbing is tedious on the loose gravel path as it winds through the worn-down gully. In 0.9 miles from the parking area, the trail crosses a ski trail known as Kinsman Glade, where the trail becomes very rocky. Switchbacks continue through the glade, and the trail crosses it three more times. Each time, the view through the trees improves. At the best viewpoint, you can look north across Echo Lake and Bald Mountain to the distant Great North Woods as well as across the notch to Eagle Cliff. After the last crossing, the trail climbs over extremely rocky terrain along the left side of the glade. After 0.4 miles in Kinsman Glade, the trail turns left and climbs more gradually for 0.3 miles to a rocky area. Here, turn left onto a spur trail and walk out to a magnificent ledge viewpoint above the Cannon Cliffs, where there are wide views across the notch to the Franconia Range and south over the flat lands along Rt. 93. You can also look up to Cannon's summit. The main trail climbs briefly over the East Peak of Cannon Mountain, the descends just as quickly to an area which can be muddy. The trail is fairly flat for a while, then it climbs onto open ledges, where you can see back to East Peak. The trail now stays in the open, climbing through a small talus slope with great views before going back into the forest. In 0.5 miles from the viewpoint spur, turn left onto the combined Kinsman Ridge Trail/Rim Trail, one of Cannon's gravel tourist paths. This trail leads across the slope, passing several viewpoints before swinging around to the right to head toward the summit. At this turn, Kinsman Ridge Trail turns left and leaves the tourist path. Turn right to stay on Rim Trail and quickly reach the summit. At the top of the observation tower, there are views in all directions. Now you can see over the Cannon Balls to the higher summits of North and South Kinsman. To the west, the view takes in distant Vermont. New Hampshire's Benton Range peeks out from the side of North Kinsman. To the north, the view extends far into the Great North Woods, seen over the tramway summit station and Mittersill Peak. To the east, you can look back over East Peak to the view you saw earlier. After enjoying the view, descend the tower to the lowest landing on the staircase and turn left onto Short Path. This brings you to the tramway summit station, where you can purchase food at the summit restaurant. Since hiking is not allowed on the ski trails, follow Rim Trail back to the first junction with the Kinsman Ridge Trail and turn left into the woods. Note that if you would like to visit the restaurant before the summit tower, you can, obviously, hike the short loop in the opposite direction it was described in.